Whether you have had a mastectomy or a lumpectomy, if you have had lymph nodes removed you are at risk of developing lymphedema. And, if you have radiation treatment following your surgery your risk is increased. This type of lymphedema is known as Secondary Lymphedema, and is a result of damage to the lymphatic system. Your lymphatic system consists of lymph vessels, predominantly located just below the skin’s surface and lymph nodes in your neck, armpits and groin. It is those lymph nodes located in the armpit that are most often affected during breast cancer surgery. Lymphatic fluid is a protein rich liquid that flows through the lymphatic system. While blood capillaries are pumping blood, the changes in pressure cause the lymphatic fluid to be released into the interstitial layers of the skin. This same pressure then causes most of the lymphatic fluid to be re-absorbed by the blood capillaries. The lymph nodes serve as the entry way for this fluid to re-enter the circulatory system. When lymph nodes are removed this limits the lymph system’s ability to help the circulatory system re-absorb the lymphatic fluid. This fluid that is not re-absorbed accumulates in the interstitial layers of the skin causing chronic swelling. This chronic swelling is lymphedema. If left untreated it may result in hardening skin tissue. While lymphedema most often occurs in the arm, and sometimes the hand, of the side of the body on which the lymph nodes were removed, it can also occur in the chest or back, or in the remaining breast of a lumpectomy patient. It can occur within a few months after surgery or years later. The first obvious sign of lymphedema is swelling characterized by “pitting”. This is recognizable when the skin is depressed for a few seconds and the indentation does not immediately disappear. Other symptoms may include a tightness or heaviness in the affected area, or changes in the texture of the skin. You may even notice that jewelry and clothing feel tighter. The first stage of treatment for lymphedema is Manual Lymph Drainage (MLD). The goal of MLD is to reduce swelling and to maintain this reduction. It is practiced by a trained practitioner who employs gentle pressure and slow movements to move fluid toward functioning lymphatics. If differs from traditional massage in that the stroke used is very light whereas massage tends to use deep, penetrating strokes across the tissues. The length of treatment varies depending on the severity of the condition but most commonly is performed several days a week for 2 – 4 weeks. Once the swelling is reduced the patient is fitted with a graduated compression garment. It should be noted diuretics are not appropriate as lymphedema is a condition that affects the lymphatic system, specifically, and is different from edema. This is where Second Act can help. 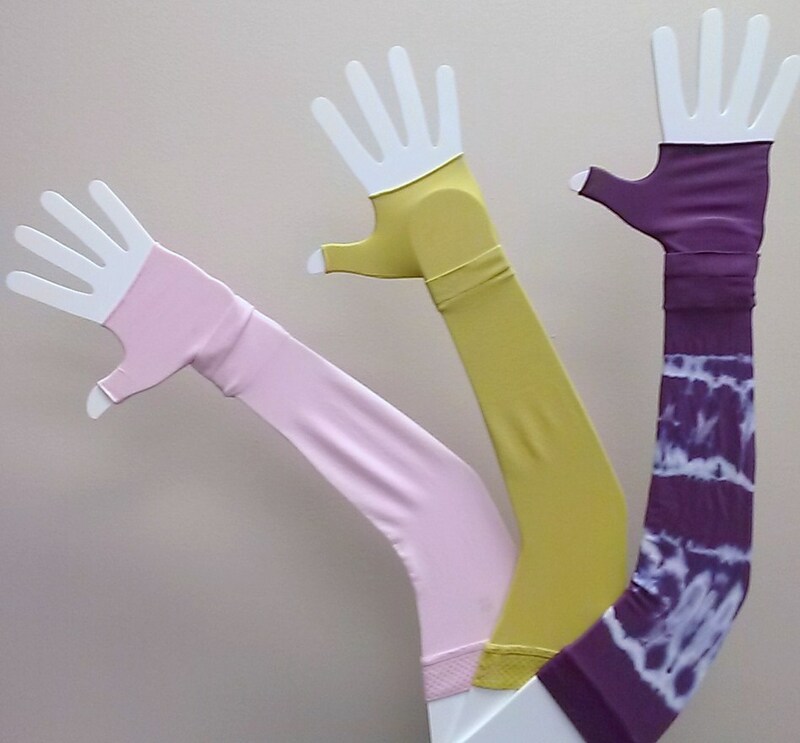 Lymphedema sleeves, gauntlets, gloves and bras are fitted by our specialists who have been trained to properly fit such graduated compression garments. Sleeves come in a range of sizes and colors. And while beige and darker skin toned sleeves are most common, we also offer seasonal colors, even tie-dye, with matching or coordinating colored gauntlets. Gauntlets cover the back and palm of the hand but not the fingers. This allows for greater dexterity and is often adequate to control the swelling that can sometimes move into the hand. However, for those individuals whose lymphedema has moved into their fingers, there are gloves with finger stubs. Compression bras offer gradient pressure support to the affected breast, and most women find they help reduce pain that lymphedema of the breast often causes. There are also bras without a defined cup that can provide compression to the chest of women who have had bilateral surgery and are experiencing lymphatic swelling of their chest. Moderate exercise such as swimming, walking, biking, light strength training and yoga are recommended. During these times lymphedema garments should be worn, as well as when traveling by air. Compression sleeves should never been worn when sleeping. Self management and compliance are key to controlling lymphedema. While it cannot be reversed, following the instructions of your physician and/or therapist can make all the difference as to how much lymphedema affects your day-to-day activities. • Avoid cuts, scratches, burns and insect bites. If any of these happen, be sure to clean the wound thoroughly and cover it to protect it from dirt and infection. • Have blood pressure taken, injections, blood draws and IV’s in the unaffected arm. • Do not carry a heavy purse, shoulder bag, luggage or groceries with the affected arm. • When flying put on your compression garment an hour before your flight and wear it for a least one hour after landing. Insurance coverage varies greatly. Some private insurance companies do cover the cost of compression garments, as does Illinois Medicaid. These garments are NOT currently covered by Medicare. In all case, a doctor’s order of medically necessity is required, just as with breast prostheses and mastectomy bras. Products shown are representative of the many styles and colors we carry. Exact products in stock at the time of your visit may vary. If there is an item that interests you please feel free to call or email us for availability. Gift certificates available. Call or email us for details.